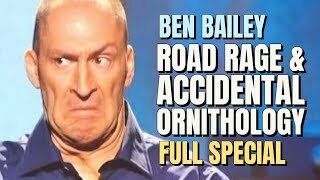 Before he got behind the wheel of The Cash Cab, Ben Bailey began his career as a Stand Up comedian. As a young man, Bailey left his home (a small town in New Jersey) and headed to Los Angeles to pursue his dream of a career in show business. Just a few weeks later, he found himself onstage at The Comedy Store on the Sunset Strip and quickly became a crowd favorite at the clubs in New York City. He has since performed at all the major festivals, including Montreal and Chicago (Just For Laughs), the (hallowed & former) Aspen Comedy Arts Festival, The Edinburgh Fringe Festival, and at clubs and theatres around the world. He has starred in two specials for Comedy Central; his most recent – “Road Rage and Accidental Ornithology” – has been a huge hit on Netflix for the last few years, and he has a new special due out in the spring.By the summer of 2005, Bailey had appeared in several commercials on FOX’s “Mad TV,” become a regular on “Tough Crowd w/ Colin Quinn,” recorded his first special for Comedy Central, and made stand up appearances on HBO, NBC, “Star Search,” “Last Call w/Carson Daly,” and “The Late Show.” It seemed that Bailey’s star was on the rise…and then along came “Cash Cab.” Bailey drove the smash-hit series (still on in syndication around the world) for over 400 episodes, and he and the show won 6 Daytime Emmy Awards.Bailey has appeared on “The Tonight Show,” “The Today Show,” The Oprah Winfrey Show,” “Rachel Ray,” and virtually every major morning show (TV & radio) in the country, and has gone on to host several other TV shows, including “Who’s Still Standing” for NBC, “Best in the Business” and “After the Catch” for Discovery, as well as several pilots. He has appeared in numerous other TV shows, such as “30 Rock,” “Parenthood,” “Law and Order,” “Hope & Faith,” “The Knights of Prosperity,” and “One Life to Live,” as well as several films, including “Bad Parents,” “Don’t Shoot the Pharmacist,” and “Bad Meat.”Bailey can currently be seen hosting segments on NatGeo’s “Brain Games” and has a new show in the works with A&E, as well as commercial campaigns for DTE Energy, Nature Valley nut bars, and Aldi Supermarkets. Bailey tours as a national headliner; you can see him live at a theatre or comedy club in your area and in his latest stand up special, released in 2015.